If you’ve bought Sriracha sauce at the Asian market (and if you haven’t, what are you waiting for? ), you’ve probably noticed two other bottled chili sauces parked right by it—sambal oelek and chili garlic sauce. All three are made by the same company, Huy Fong, and sport lids of the same shade of grassy green. Try sampling the condiments side by side, you’ll taste the finer nuances of each. And while you could use them interchangeably, I reserve each sauce/paste for a different purpose. Mellow and sweet, Sriracha sauce is often used as a condiment for soups (what would Vietnamese pho lovers do without Sriracha?! ), fried noodles, even hamburgers, and pizzas. 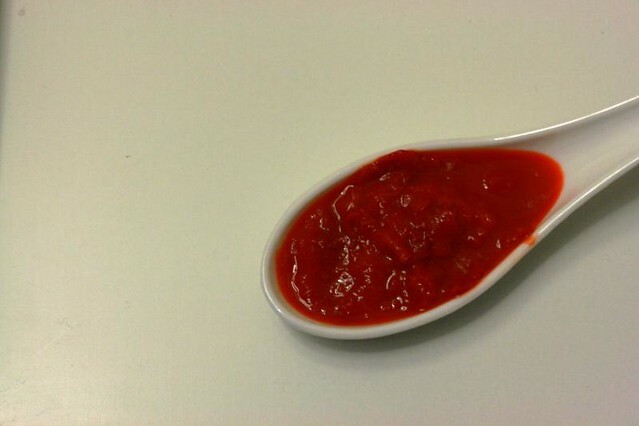 In fact, its popularity knows no bounds as trendy restaurants invent novel ways to incorporate the vermillion-colored sauce into mainstream dishes. Some concoctions I’ve come across: Sriracha mixed into mayo for an Asian-style aioli, or in a Bloody Mary. Chili garlic sauce and sambal oelek are used more for cooking. Chili garlic sauce, with its garlicky flavor, is perfect for stir fries and to make mabo dofu. I also use it in a dipping sauce with soy sauce and vinegar for dumplings. The combination of heat and tang in sambal oelek is well-suited for tuna salad, and as a shortcut ingredient to make beef rendang (or any other spicy Indonesian dish for that matter). My heart, however, belongs to sambal oelek. Of course, since we both come from the same Indonesian stock. And while I do have a Huy Fong bottle sitting in my fridge, I also enjoy making it fresh the traditional way—hand-ground in a basalt stone mortar or ulek (oelek is the old Dutch spelling) with a pestle (ulekan). It’s so simple, I make just enough for one meal. There are so many other sambals in Indonesian cuisine: sambal terasi, sambal badjak, sambal kecap, etc., and I’m planning on a sambal series over the next few months. Plus, I’ll also show you how a little tweaking to the original sambal oelek recipe can give you Hainanese chicken rice chili and steamboat chili! For now, here’s my method for making sambal oelek. 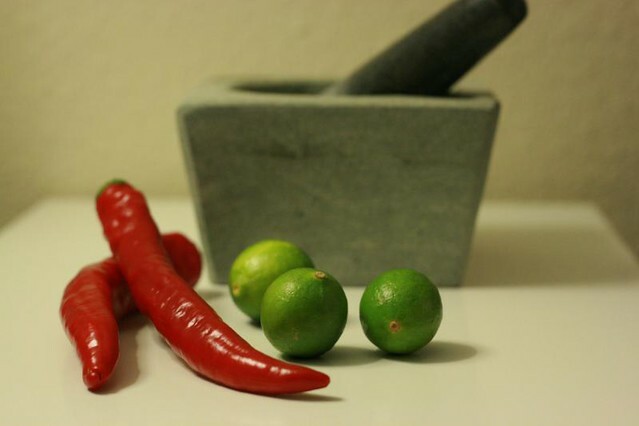 The basic sambal oelek “recipe” calls for just chilies and salt. If you like it spicy, add some bird or Thai chilies. The Indonesian name for the long chilies used in sambals is cabe keriting or curly chili, but any long chili like Fresno or Serrano (or whatever chilies are waiting to be picked in your garden before the first frost appears) will do. I found some nice, fat unnamed long chilies about 8-inches long at my market. A small bowl of the finished sauce plate-side next to some fried chicken or fresh-cut vegetables will have you dip-dipping away! Remove the stems and slice the chilies lengthwise. Remove as much membrane and seeds as you like (these are what give chilies heat, and as you can tell from the photos I’m a wuss). Chop the chilies up and place in the mortar with a generous pinch of salt. 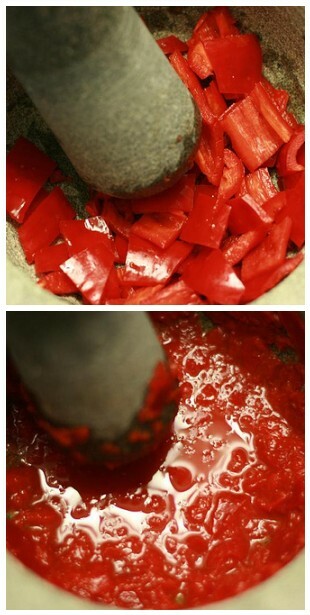 Grind the chilies with the pestle using a twisting motion until pulpy. Add the lime juice and more salt and sugar to taste. Serve immediately. Note: If you make the sambal in bulk (I strongly advise a food processor! ), it will keep in a sterilized jar in the fridge for a few weeks. 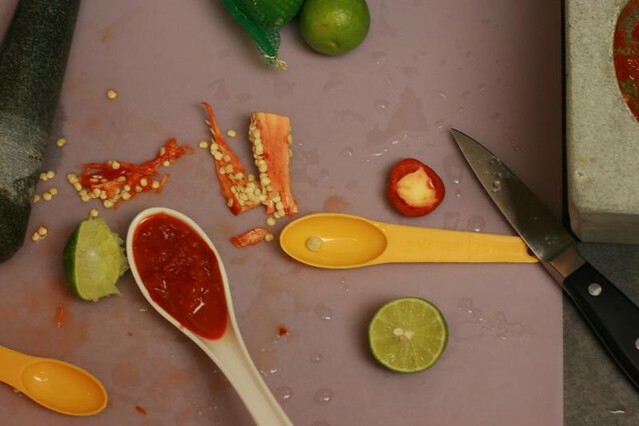 What’s your favorite way to use sambal oelek? I have bags of chilis from my garden stored in the freezer, can these be used for sambal? I prefer lime juice over vinegar, no sugar, and I leave the seeds in the ripe Thai chilis. Homemade is the way to go! For me, absolutely no garlic! Btw, my mother was an Asian grandmother (RIP). 6 grandkids! I was just about to head off to the supermarket to buy some sambal oelek ( I didnt even know what it was..) til I stumbled upon your recipe. Since I much prefer homemade and have some chillis in the garden I made this easy recipe. ; It is soooooo good. My hubby just loves it and now i am going to make it in bulk.. Thankyou so much. Hello and thanks for these insights! Hi Pat, thanks. I have been reading your site for a few days now. Hopefully I will be doing your lemongrass chicken this weekend. I fell in love with Indonesian food in 87 on my first trip to the Netherlands. Melt butter in saucepan and add blended paste & salam. Cook over low – medium heat for about 10 minutes or to thickness you desire. Thank you, I just discovered your site and I must say the jar of Sambal I buy is usually on the bottom shelf. I buy the gallon jar of Huy Fong. Great with peanut butter on toast for breakfast and I am neither Indonesian or Dutch. I grew some serranos to make Sambal Ulek with and did and it is long gone. I will enjoy reading more and maybe I will even add my Sambal badjak recipe, I haven’t made it in a few years though. I love this! You fed my brain and also fueled my appetite for eating/cooking with/making this gorgeous feisty condiment. Hi Nancie, try experimenting with it and see what you come up with. Thanks for visiting!